Stanford University, Center for Latin American Studies (February 20, 2018). 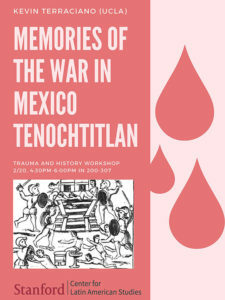 Trauma and History Workshop; Presented a paper, Memories of the War in Mexico Tenochtitlan. Getty Center, Los Angeles (December 2017). Conference: Indigenous Knowledge and the Making of Colonial Latin America. Participated in Roundtable Discussion. Museo Nacional de Antropología e Historia, Mexico City (November 2017). Instituto Nacional de Antropología e Historia, Dirección de Etnohistoria. Conference: III Congreso Internacional de Etnohistoria de América: Origen, Desarollo y Porvenir de la Disciplina. Presented keynote address titled: "Algunas observaciones sobre la trayectoria de la etnohistoria: Una perspectiva desde el norte" and participated in Roundtable Discussion. Southwest Seminar: Consortium on Colonial Latin America, University of California, San Diego (October 2017). Presented paper titled: "The Politics of Translation: Book 12 of the Florentine Codex" and presented public talk titled "When did Columbus Discover the United States?" Stanford Center for Latin American Studies (March 2017). Taller de Lenguas Indígenas de America Latina: Pedagogía y Tecnología. Keynote speaker and participant in workshop. El Colegio de Michoacán, Mexico (October 2016). 38th Coloquio de Antropología e Historia Regionales. La Escritura Indígena Mesoamérica: De la Estela al Texto Digital. Presented paper titled: "La conquista emplumada de México." The UCLA William Andrews Clark Memorial Library (October 2016). Conference: The Quest for Certaintly in Early Modern Europe: From Inquisition to Inquiry, 1550-1700. Presented paper titled: "50 Questions in Search of Certainty: The Relaciones Geográficas of New Spain and its Discontents." UCLA American Indian Studies 10 (October 2016). Presented guest lecture on Mesoamerica. Vanderbilt University (March 2016). Symposium on distance-learning of less commonly taught languages spoken in Latin America. Presented paper titled: "Some Lessons Learned from Teaching Nahuatl at UCLA." Annual Meeting of the American Society for Ethnohistory, Las Vegas, Nevada (November 2015). Presented paper titled: "The Feathered Conquest of Mexico." Stanford University, Center for Latin American Studies (November 2015). Participated and presented in workshop titled "Education and Research on Latin America: The Role of Centers for Latin American Studies in U.S. Universities." The Getty Research Institute, Scholar's Conference (May 2015). Canon, Object, Value. Presented paper titled: "Canons Seen and Unseen: Images of the Conquest of Mexico in Spain, New Spain, and Beyond." The Los Angeles County Museum of Art, Docents' Invited Lecture (May 2015). "La Casa de la Cacica: A Mesoamerican Royal Palace in Colonial Mexico." The UCLA William Andrews Clark Memorial Library and The Getty Research Institute (April 2015). Visual and Textual Dialogues in Colonial Mexico and Europe: the Florentine Codex. Co-organized conference with Jeanette Peterson. Presented paper titled: "Reading Between the Lines in Book XII." Annual Meeting of the American Society for Ethnohistory, Indianapolis (November 2014). Presented paper titled: "The Representation of Latin America in the Ethnohistory Journal." Chaired and commented on two panels. XVI Reunión Internacional de Historiadores de México, Chicago (September 2014). Chaired panel: "Nuevas palabras para un viejo paisaje: representaciones del pasado y el presente de la cuenca de México durante el siglo XVI." The UC Humanities Research Institute, UC Irvine (June 2014). Co-organized symposium "Silver Seaport: Global Trade and Artistic Exchange in the Early Modern Era." Presented paper titled: "Silversmiths in New Spain." The UCLA Department of Comparative Literature, the UCLA Department of Musicology, and the UCLA Latin American Institute. Series titled: "Music from the Inka Trail: A Multi-Media Four-Lecture Series on South American Music" (April 2104). Presented introduction to second lecture titled: "The Music of Viceregal Latin America." UC San Diego Center for U.S.-Mexican Studies (January 2014). Conference on "Territoriality, Conflict, and the Polis in New Spain: The Creation of Colonial Communities after the Great Death." Presented paper titled: "Conflict in the Courts of New Spain: The Case of 'La Casa de la Cacica'." Annual Meeting of the Textile Society of America, Los Angeles (October 2013). Participated on panel "Five Centuries of Mexican Sericulture." Presented paper titled: The Mexican Silk Boom of the 16th Century." The UCLA William Andrews Clark Memorial Library (October 2013). Iberian Globalization of the Early Modern World. Moderated Session 1: Contested Cultures of the Sacred. Chaired panel titled "Ways of Proceeding." The Getty Research Institute (October 2013). Books and Prints in the Spanish Americas Workshop. Presented paper titled "Rare Books on the Conquest of Mexico at the Getty." UCLA (October 2013). American Indian Studies 10. Presented guest lecture: "Native American Strategies in the Atlantic World: New Spain, Peru, and North America, 1550- 1750." 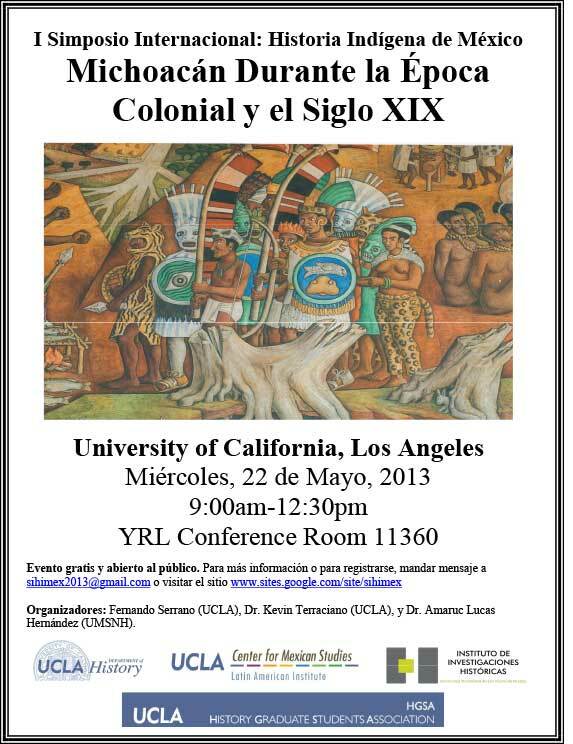 UCLA Latin American Institute and Department of History (May 2013). Simposio Internacional: Historia Indígena de México. Commented on paper: "Un catecismo y otros escritos en lengua Tarasca," by Dr. Amaruc Lucas Hernández (Universidad Michoacana de San Nicolás de Hidalgo). University of New Mexico Latin American and Iberian Institute, Albuquerque (April 2013). Colonial Authority and Identity in Ibero-America. 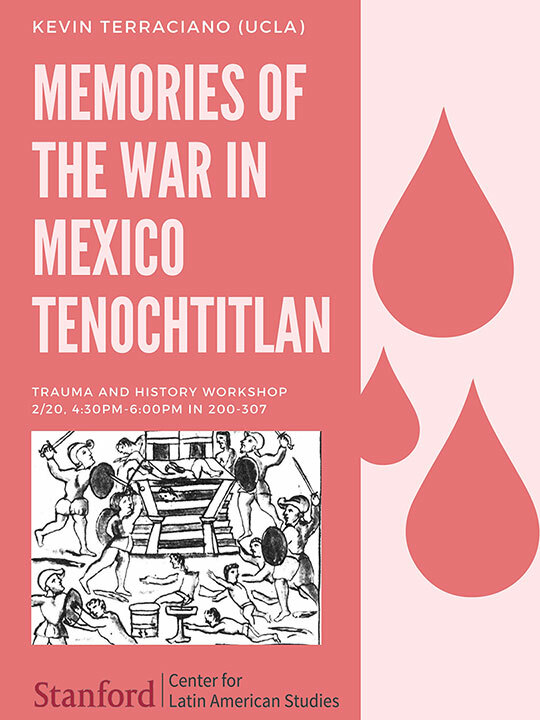 Presented Paper: "Memories of Mexica Heroes in the War on Mexico." Annual Meeting of the American Society for Ethnohistory, Springfield, Missouri (November 2012). Presented presidential address: "Apocalyptic Memories in Sixteenth-Century New Spain." Presented paper: "Telling Time in the Codex Sierra Texupan." UCLA (October 2012). American Indian Studies 10. Presented guest lecture: "Cacicas or female rulers in Colonial Mexico: The Case of the Casa de la Cacica in Oaxaca." Meeting of the International Congress of Americanists, Vienna, Austria (July 2012). Presented paper: "The Meaning of Leaves and Year Signs in the Codex Sierra of Texupan." The John Carter Brown Library at Brown University, Providence, Rhode Island (June 2012). Mesoamerican Colonial Literacy Workshop. Presented paper: "The Interplay between Text and Image in a Mixtec-Nahuatl Text from the Mid-Sixteenth Century known as the Codex Sierra Texupan." Centro Académico y Cultural de San Pablo, Oaxaca, México (April 2012). Coloquio sobre Lenguas Otomangues. Presented paper: "Algunas convenciones pictográficas basadas en las lenguas indígenas en el Códice Sierra de Santa Catalina Texupan, 1550-1564." The Huntington Library (March 2012). Early Modern Seminar. Presented paper: "The Many Faces of Moteuczoma in Colonial Mexico." California State University, Los Angeles (February 2012). Cultural Continuity in Central Mexico: Conference in Honor of Alfredo López Austin. Presented paper: "Fifteen years of Change and Continuity in the Mixtec-Nahua Codex Sierra, 1550-1564." The Huntington Library (January 2012). Colonial Latin America Seminar. Led discussion of book (Making a New World: Founding Capitalism in the Bajío and Spanish North America) with author, John Tutino. Los Angeles County Museum of Art and UCLA (December 2011). Exhibition symposium for Contested Visions in the Spanish Colonial World. Presented paper: "History in the Eye of the Beholder: Writing and Painting the Conquest of Mexico." American Society for Ethnohistory, 2011 meeting. University of California, Berkeley (April 2011). UC Early Modern Research Group on Latin America. Presented paper: "Contested Visions of the Conquest of Mexico." The Huntington Library (October 2010). The 100th Anniversary of the Mexican Revolution. Presented paper: "A Longue-Durée View of the Mexican Revolution, 1810-2010." Annual Meeting of the American Society for Ethnohistory, Ottawa, Canada (October 2010). Commented on panel: "Continental Divide: Reconnecting the Early Americas." Instituto Nacional de Antropología e Historia, Dirección de Estudios Históricos, Tlalpan, Mexico City (May 2010). Seminario Internacional sobre Mito e Historia: Homenaje a Don Wigberto Jiménez Moreno. Presented paper: "Cuando Cuauhtemoc fue a saludar al gran teotl tlatoani de Castilla: Narrativas indígenas sobre la conquista de México." Linfield College, Linfield, Oregon (May 2010). Jonasson Lecture Series. Presented paper: "Nahua Reflections on the Great Epidemics of Sixteenth-Century New Spain." The University of Texas, Department of History, Austin (May 2010). Presented paper: "When Cuauhtemoc Went to Greet the Great Teotl Tlatoani of Castile: Nahua Memories of the Conquest of Mexico." The University of Texas, Benson Latin American Library, Austin (May 2010). Presented paper: "The Unspeakable Cocoliztli of New Spain." Paul Getty Museum (April 2010). Altera Roma: Art and Empire from the Aztecs to New Spain. Moderator of panel: "Parallel Pantheons. "The Huntington Library (April 2010). Early Modern Studies Institute: American Origins series. Presented paper: "A Historiography of the Indians of New Spain." University of California, Irvine, Group for the Study of Early Cultures (February 2010). Speak, Paint, Write: Colonial Scripts and Indigenous Literacies in Latin America. Presented paper: "Contested Nahua and Spanish Accounts of the Conquest of Mexico in the Florentine Codex." Annual Meeting of the American Historical Association, San Diego (January 2010). Commented on two panels: "Revisiting the Spiritual Conquest: Religious Persecution and Native Resistance in Colonial Mexico" and "Peyote: Cultural Uses and Political Responses in Mexico: Sixteenth through Nineteenth Centuries." UCLA Department of Spanish & Portuguese (November 2009). Jornadas de Cultura, Lengua, y Literatura Coloniales. Presented plenary paper: "Power and Gender in Colonial Mexico: The Case of la Casa de la Cacica." Annual Meeting of the American Society for Ethnohistory, New Orleans (October 2009). Organized double session: "Strategies for Survival among Nahua, Mixtec, and Zapotec Elites in Colonial Mesoamerica." Commented on three papers in part 1: "Competing for Resources." In part 2, "Bridging Cultural Borders," presented paper: "The Contested Claims of Caciques to History and Power in New Spain." Meeting of the International Congress of Americanists, Mexico City (July 2009). Presented paper: "La actuación del poder en las ceremonias sagradas y profanas del Oaxaca colonial: los rituales de posesión del palacio real o tecpan de Yucundaa (San Pedro y San Pablo Teposcolula), 1569." Center for Mexican-US Studies, University of California, San Diego (June 2009). The Great Death in Colonial Mexico. Presented paper: "The Unspeakable Cocoliztli of New Spain: Indigenous Commentaries on Disease in the Sixteenth Century." California State University, Los Angeles (May 2009). Change and Continuity in Mesoamerica. Presented paper: "The Power of the Pen: How a Oaxacan Community Defended its Lands with Zapotec-Language Writings." Harvard University (March 2009). Atlantic History: Conference on Languages and Cultures. Presented paper: "Writing and Revelation in Early Colonial Oaxaca." Annual Meeting of the American Historical Association, Washington, D.C. (January 2009). Presented paper: "Imagined Conquests: Indigenous 'Allies' of the Spaniards in the War on Mexico Tenochtitlan." Johns Hopkins University, Baltimore (November 2008). Colloquium on the Atlantic World. Presented paper: "Indigenous Views of the Atlantic World from New Spain, Peru, and North America." The University of Chicago (May 2008). Latin American Studies Working Papers Series. Presented paper: "Imagined Conquests: Indian ‘Allies’ of the Spaniards in the Conquest of Mexico." Annual Meeting of the American Historical Association, Washington, D.C. (January 2008). Presented paper: "Constructions of Indigenous Identity in Mexico Based on Memories of the Conquest." Annual Meeting of the American Society for Ethnohistory, Tulsa, Oklahoma (November 2007). Presented paper: "Three Texts in One: Images of the Conquest of Mexico in Book XII of the Florentine Codex." Chaired Panel: "Indians and Africans in the Crucible of Conquest." University of Galway, Ireland (September 2007). Colloquium on the Atlantic World. Presented paper: "Recovering Native Voices from the Atlantic World." The Los Angeles County Museum of Art (February 2007). Participated in NEH Advisory Meeting for exhibit: "Contested Visions: The Image of the Indian in Colonial Mexico and Peru." Exhibit opened in 2011 at LACMA, Mexico City in 2012. UCLA Clark Library (February 2007). Imperial Models in the Early Modern World. Chaired panel: "Managing Difference in Early Modern Empires." Biblioteca Francisco de Burgoa, Oaxaca, Mexico (April 2006). Coloquio Francisco Belmar: Las lenguas oaxaqueñas ante el siglo XXIX. Presented paper: "Las variantes de la lengua mixteca en la escritura alfabética de la época colonial." Annual Meeting of the American Society for Ethnohistory, Santa Fe, New Mexico (November 2005). Chaired panels: "Spiritual Border Spaces in Colonial Mexico and Oaxaca" and "Urban Indians in Colonial Mexico: Examples from the North, Center, and South." Caras y mascaras del mexico etnico. Colegio de Michoacan, Zamora, Mexico (October 2005). Caras y máscaras del México étnico: La participación indígena en las formaciones del estado mexicano. Presented paper: "La genealogia de la memoria social indígena; las construcciones estratégicas del pasado en los títulos primordiales de la época colonial." Princeton University, Department of History, New Jersey (January 2005). Presented paper: "Conflicting Histories of the Conquest of Mexico." UCLA Center for Medieval and Renaissance Studies (October 2004). Rediscovering Columbus. Presented paper: "New Perspectives on the Encounter from Indigenous Points of View." Instituto Nacional de Antropología e Historia, Oaxaca, Mexico (June 2004). La Mesa Redonda de Monte Alban. Presented paper: "Algunas observaciones sobre los mercaderes y los mercados en la Mixteca Alta durante la época colonial." UCLA (April 2004). Meeting of the Society for Spanish and Portuguese Historical Studies. Chaired and commented on panel: "Tensions between the Monarch and his Officials." Annual Meeting of the American Historical Association, Washington, D.C. (January 2004). Commented on panel: "Some Questions of Race, Sexuality, and Legitimacy Considered by the Inquisition in Colonial Mexico and Guatemala." 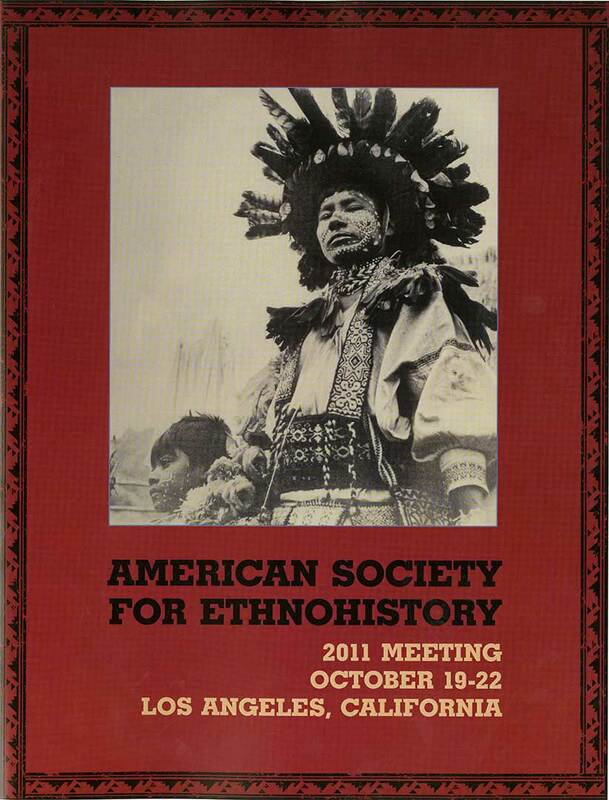 Annual Meeting of the American Society for Ethnohistory, Riverside, California (October 2003). Presented paper: "La Casa de la Cacica of Teposcolula, Oaxaca: A 16th-Century Mixtec Palace, Past and Present." Commented on panel: "Indigenous Peoples and the Catholic Church." University of California, San Diego Department of History (May 2003). Presented paper: "How the Use of Native-Language Sources Has (and Has Not) Changed the History of Colonial Mexico." Annual Meeting of the Pacific Coast Council on Latin American Studies, Los Angeles (November 2002). Presented paper: "Time and Memory in Native-Language Writings from Colonial Mexico." UCLA (October 2002). Mesoamerican Ethnohistory: Conference in Honor of UCLA Professor Emeritus James Lockhart. Principal organizer of conference. Presented paper: "Mixtec Writings from Colonial Oaxaca." Occidental College, Eagle Rock, California (April 2002). Invited Speaker’s Series. Presented paper: "The Inquisition in Oaxaca, Mexico, 1544." UCLA Center for Medieval and Renaissance Studies (March 2002). Faculty Roundtable. Presented paper: "Native Responses to the 'One God from Castile' in Early Colonial Mexico." Tulane University, New Orleans (April 2001). The Mexican Church. Presented paper: "Ambivalent Responses to Christianity in Early Colonial Oaxaca." Annual Meeting of the American Historical Association, Boston (January 2001). 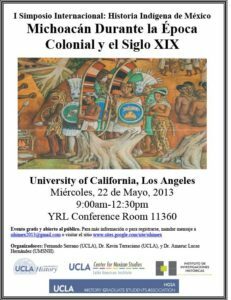 Organized panel: "Rituals of Gender and Power in Colonial Mexico." Presented paper: "Mixtec-Spanish Ceremonies of Palace Possession in Colonial Oaxaca." UCLA (May 2000). La Voz Indígena de Oaxaca: Indigenous Languages of Oaxaca, Mexico. Co-organizer of conference. Presented paper: "Mixtec Strategies of Verb Borrowing in Colonial Texts." UCLA (February 2000). American Indian Linguistics Seminar. Presented paper: "The Use of Loan Verbs in Colonial Mixtec and Nahuatl Texts." Annual Meeting of the Rocky Mountain Conference on Latin American Studies, Santa Fe, New Mexico (January 2000). Presented paper: "Long-Distance Mixtec Merchants in Sixteenth-Century Oaxaca." UCLA (October 1999). Chicano Studies 10. Presented lecture: "Introduction to Mesoamerica." University of Leiden, Netherlands (June 1999). Symposium on Mesoamerican Writing. Presented paper: "The Colonial Context of Mixtec Images and Texts in the Sixteenth Century." UCLA (May 1999). American Indian Linguistics Seminar. Presented paper: "Nahuatl and Mixtec Borrowing Conventions." UCLA (April 1998). American Indian Linguistics Seminar. Presented paper: "Mixtec Pronunciation of Spanish, as Evidenced in Colonial Mixtec-language Texts." UCLA Center for the Study of Women (April 1998). Presented paper: "Reading Women Into History: Native Rulers in Colonial Oaxaca, Mexico." UCLA (March 1998). American Indian Linguistics Seminar, Presented paper: "Spanish Loan Words in Mixtec Texts." UCLA (December 1997). American Indian Linguistics Seminar. Presented paper: "Mixtec Phonetics." Annual Meeting of the American Society for Ethnohistory, Mexico City (November 1997). Presented two papers: "Images of the Virgin Mary in the Mixtec Kingdom of Heaven," and "Social Relations and Obligations in the Mixtec Community." UCLA (May 1997). American Indian Linguistics Seminar. Presented paper: "Honorific Speech in Sixteenth-Century Mixtec and Nahuatl Texts." University of California, Riverside (April 1997). Early Theories of Toleration in Comparative Perspective. Presented paper: "Discourses of Tolerance and Intolerance in Early Spanish American Writings." University of California, Riverside (February 1997). University of California Latin American Historians. Presented paper: "The History of Indians in Colonial Latin America: Recent Evolution and Potential." Annual Meeting of the American Anthropological Association, San Francisco (November 1996). Presented paper: "Ethnic Identity in Colonial Oaxaca." Puebla, Mexico (August 1996). 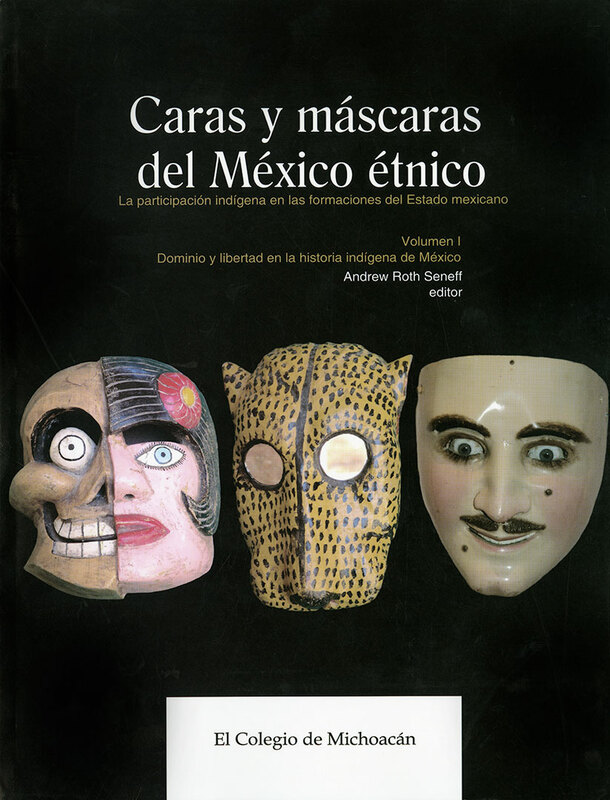 Tercer Simposio Internacional de Códices y Documentos sobre México. Presented paper: "El Contexto Histórico del Códice Sierra, 1550-1564." Berkshire Conference on the History of Women, Raleigh, North Carolina (June 1996). Presented paper: "Adultery and Homicide in Colonial Mexico: The Case of the Mixtec Murder Note." UCLA (May 1996). American Indian Linguistics Seminar. Presented paper: "Evidence of Language Contact Phenomena in Nahuatl and Mixtec Texts." UCLA Extension (June 1995). Course on Ancient Oaxaca. Presented lecture: "Writing in Ancient and Colonial Oaxaca." Annual Meeting of the American Historical Association, San Francisco (January 1994). Organized panel: "Primordial Titles as Sources on the Spanish Conquest of Mexico." Presented paper "Mixtec and Nahuatl Accounts of the Conquest of Oaxaca: 'Indian' Identity in Multiethnic New Spain." Annual Meeting of the American Society for Ethnohistory, Salt Lake City, Utah (October 1992). Presented paper: "Mixtec-language documents from Colonial Oaxaca."